This is part 4 of a 4-series story on the question of whether a 4WD is a must when it comes to overland vehicles. Here are part 1, part 2, and part 3. This blog shares examples of overlanders with a 2WD overland vehicle. Coen and I have argued in the above-mentioned series ‘Is a 4WD a Must for Overlanding’ that you don’t depend on an expensive, super-fancy four-wheel drive with all kinds of (recovery) gadgets to drive to Asia or South America. You can, of course, and many feel comfortable doing exactly that. Our point is that there is no necessity. This means, among other things, that you don’t need a huge cushion in the bank either to undertake a journey of a lifetime. We couldn’t, and still can’t, say anything about Africa because we haven’t been there, but below you’ll find some overlanders who have. Recently we came across a couple of awesome examples of overlanders who exactly prove our point. 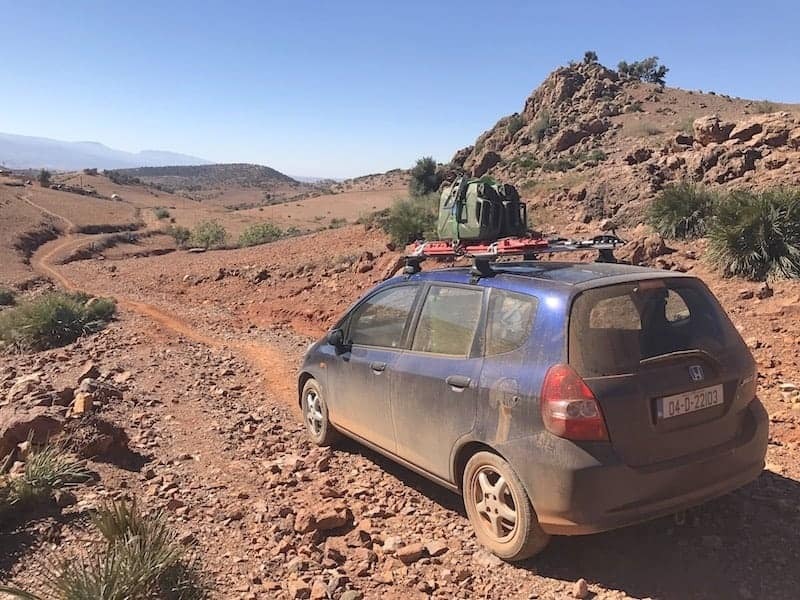 Overlanders who have driven across the world in fabulous 2WD overland vehicles: a Mini, a Fiat Punto, a Honda Jazz, a TVR Chimaera, among others. Here is their story. We hope they will inspire you to drop the excuse ‘I don’t have money to buy a proper rig’ and just go! Have fun reading, and even more, have fun on your trip. Let us know when and where you’re going (e.g. in the comment section below) and we’ll follow you! Journey: 7000+ miles from Ireland via France and Spain to Morocco (4 days for Dublin-Algeciras / 6 days in Morocco / 4 days Algeciras-Dublin). What inspired you to buy this vehicle? Versatile cargo capacity, cheap to run, legendary Honda reliability. I bought it in April of this year for €1100 and it’s my daily driver. As of right now, it’s nearly at 170,000 miles. I wanted nothing but top-ups of oil and water, which I checked every morning before leaving, although I suspect a wheel bearing will need to be changed soon. Was your Honda Jazz a good choice? I think it was a great choice. It can sleep one person stretched out comfortably and carry all my gear. Capable off-roader too! Would you recommend overlanding in a Honda Jazz? Traveling solo and wanting to sleep in the car: Yes. Traveling with two people: You can sleep in it comfortably if you pack light and don’t mind getting friendly with each other. For two people traveling with lots of gear: You might have to sleep in a tent. Pros: Fuel economy – returned an average of 40mpg the whole way apart from the Sahara where progress was slow. 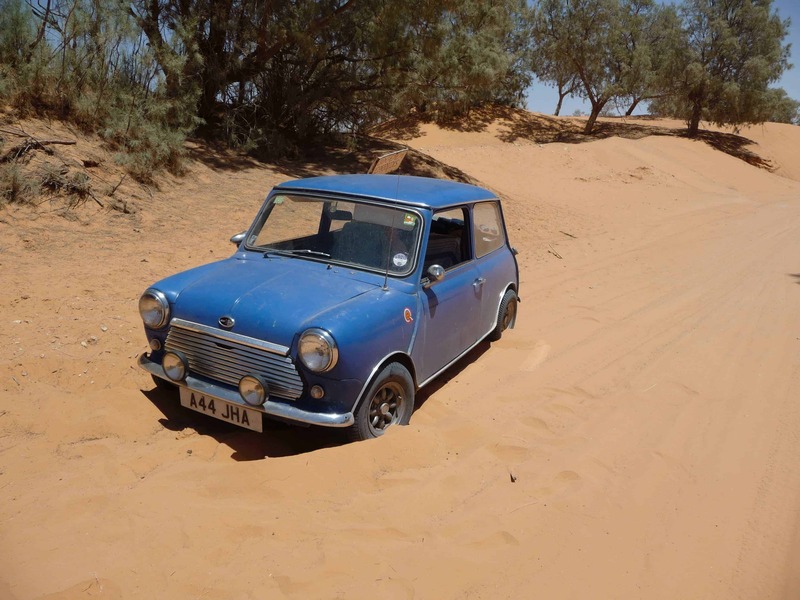 Lightweight – you can free the car by lifting the wheel arches and pushing sand under the wheels with your feet when you find yourself buried to the subframe in soft sand. Crawls over rough terrain with ease. 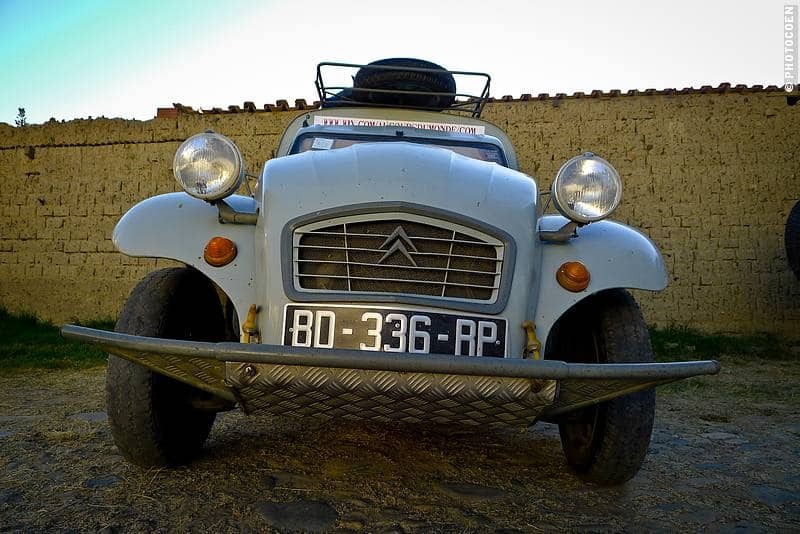 Cons: I would have liked the trim level with air conditioning, especially in the Sahara and on dusty tracks. Small fuel tank. The Jazz has a 40-liter fuel tank and most days I would fill up twice. Hence the two 20-liter jerry cans on the roof. Don’t buy anything you wouldn’t be comfortable fixing/maintaining yourself. Some off-road driving/self-recovery training is essential. No point in having recovery gear without having the knowledge to use it. I attended a full day, one-on-one training course where we covered off-road driving techniques and equipment specific to this trip. Shout out to my instructor Will Powderly! Ben has driven a number of journeys in amazing vehicles, but I reached out to him when I saw a photo of his eye-catching TVR Chimaera and asked him to tell us more about it. His 2WD Overland vehicle: TVR Chimaera, a hand-built British sports car, powered by a 4l V8 and lacking the most rudimentary ground clearance. Journey: The Pub2Pub Expedition is a journey from the northernmost bar on the planet to the southernmost that I share with co-driver Kimberley Croft. That’s 35,000 kilometers from the northern reaches of Norway to the southern tip of Patagonia, via Europe, North, Central and South America. I’ve been overlanding in quirky, off-beat vehicles for over a decade now. 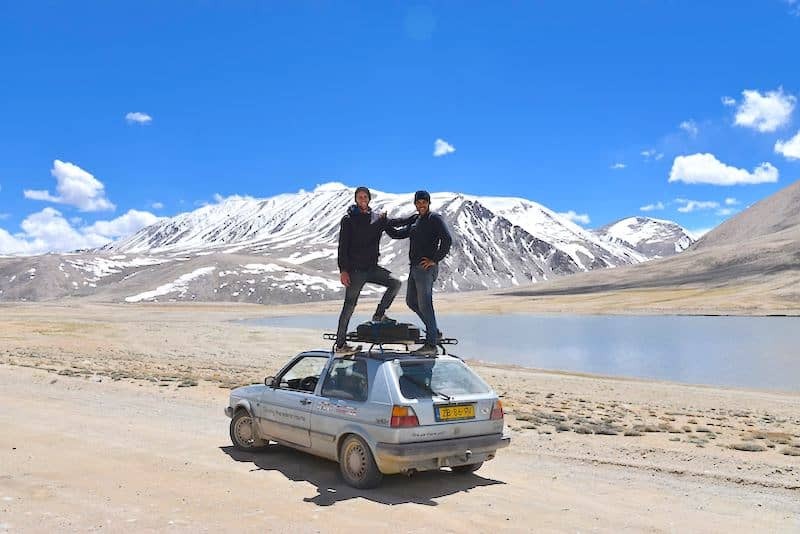 It started with an event called the Mongol Rally, which annually sees a bunch of indefatigable folk setting out to drive from Europe to Mongolia in an armada of irreverent vehicles. I completed the event in a classic Mini and so began my love of overlanding; a love that has gravitated towards the less-likely vehicular choices. Among other adventures, I’ve driven from England to South Africa in a classic Porsche and overlanded to Singapore in a Chevrolet Corvette and Rolls Royce convoy. When it came to this latest odyssey it was a given that I’d be maintaining the tradition, hence the TVR Chimaera. Has the TVR been a good choice? Emphatically, yes. So far, we’ve covered about 25,000km from Norway to Nicaragua without any real breakdowns. It’s a comfortable, stylish way to travel, with plenty of space for camping kit, and its uniqueness really acts as an icebreaker when it comes to meeting people en-route. Would you recommend overlanding in a TVR? 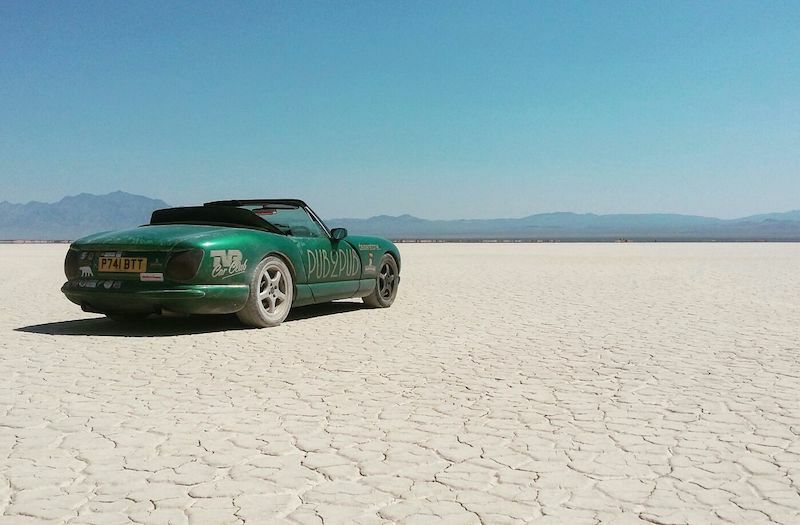 I’d definitely recommend taking a sports car overlanding for the pure irreverence and fun of doing so, but make sure it’s a car which has always inspired you – be that a TVR, Porsche, Miata or even an old Triumph. Chose something which has always struck a chord with you, and you won’t be disappointed in the experience. And make sure you chose a route that makes due consideration of the weaknesses of the vehicle. For example, drive a TVR through the Congo in the rainy season and you will end up hating the experience; cruise down the Pan-Americana in a TVR with the roof down, listening to that sonorous V8 echoing out across the Pacific and you will cherish the memory for life. Pros: The way it’s received by others. Overlanding in something so unusual really opens doors and gets people wanting to speak to you, to know your story. Cons: Occasionally, the ground clearance can force you to put a damper on your adventurous spirit. But that doesn’t mean you can’t still get a bit off the beaten track and explore – if the locals in their hatchback taxis can reach a place, the chances are the TVR can too. Ironically, the biggest downside is its Right-Hand Drive, meaning we’ve recently been facing a few issues getting it across Costa Rica and to South America, as Costa Rica has recently banned RHD vehicles from coming across the border (but we can’t blame that on the car!). Oh, and aircon would be nice right now, in Central America! Tips to share on overlanding in a sports car? This is easy: Ignore all the naysayers who’ll tell you it’s impossible. Because it isn’t. Just believe in yourself, do your research, be realistic in your aspirations, and anything is achievable! Follow the TVR’s progress on the Pub2Pub Expedition on Facebook. Or if you’d like to get inspired for overlanding in a sports car, get a copy of Survival of the Quickest, Ben’s book describing the African Porsche Expedition (get it here). As I mentioned at the beginning, it’s all about going. Beernt and Nick clearly weren’t meant to be traveling the world in a Land Rover. Instead they went with what they got: a VW Golf. Journey: After a stint in Africa Beert and Nick were ready for another trip. 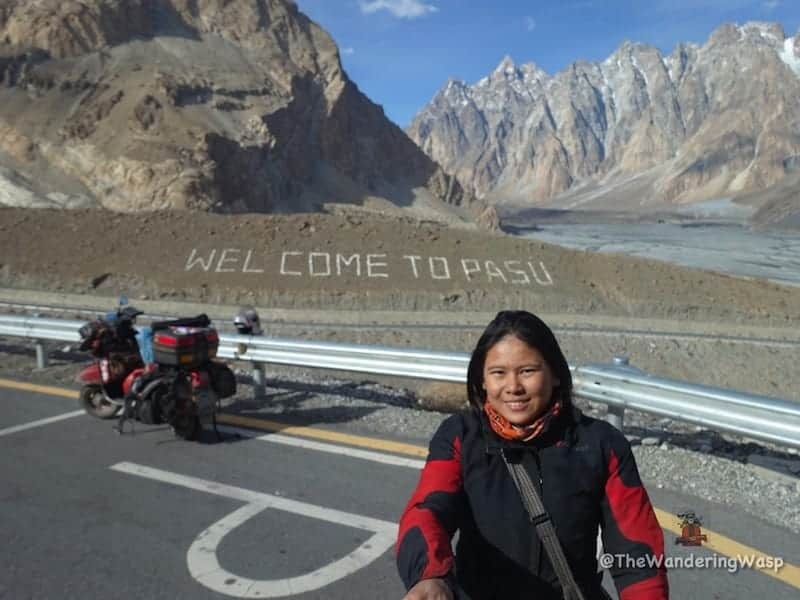 From the Netherlands to Indonesia (March – November 2017) via northern Europe to Russia, down through Central Asia into Iran, to Pakistan, India, up to Nepal, and back through India to Myanmar. After most of South East Asia we made our way down to Singapore. We had hoped to be able to cross to Indonesia but this wasn’t as easy as we thought and called Singapore the end of our overland trip on November 7. We met in 2013 doing internships in South Africa. Afterwards, we decided to travel in a 4×4. We met somebody who owned Land Rover Defender 110 but it didn’t have an engine. He would give the car to use for free but we would have to buy an engine and make it run. This seemed like a pretty good deal. We got a new engine in the car and addressed things like breaks and tires. However, the engine wasn’t happy and started using a lot of coolants. We spent a lot of time and money trying to get it fixed, but it wasn’t going to work. The LandRover owner had VW Golf and offered us to use that to travel through Namibia with while they would continue to look at the Land Rover. We had a great time, but back in South Africa we realized that the Defender was a lost cause. By then we just really wanted to get on our way. The Golf had held its own in Namibia so we decided to head out with that. We traveled 22,000 km and the Golf did an amazing job. A couple years later we were planning our next trip. We figured that if the Golf is good enough for Africa, it should be good enough for the rest of the world too. We found one owner 1991 VW Golf 2 with a 1.6 diesel engine. Was the VW Golf a good choice? We were very happy with our car as it is very simple and mechanical. The engine is bulletproof. We had a few minor issues but we were able to fix it quickly. We were amazed at how well it handled rough terrain. The VW got across everything we threw at it (and we didn’t take it easy). It is also very fuel efficient. We could usually drive about 800 kilometers on one tank, and a couple times we even managed to get over 1000. Would you recommend overlanding in a VW Golf? A Golf 2 is a friend to all. It is such a great simple little car. I would definitely recommend it to anyone. It is very reliable and in case it does break down, it can be fixed by everyone. We had mechanics fix our car who had never seen a Golf 2 before, and probably never even a VW. It’s also just a great car to drive, with a lot of character. Pro: is the simplicity and reliability of the car. Cons: It is not very big and after long hours of driving it is not very comfortable. After several days across rough, washboard roads, your bum wishes for some nice 4×4 suspension. We also had a lot of flat tires (20 in total). But in the end, all this just adds to the adventure! Annecdote or tip to share? It’s always fun to meet other overlanders and see their reaction. Most people love it. But, in Tajikistan we met a couple in a huge Unimog. They had just finished the Pamir highway and we were about to start. The woman told us that there was no way we would make it and that it would be the end of our journey. Although we did take a beating, we had a great time proving her wrong. Check out their journey on Facebook and Instagram. When I was a child, my mother drove a Mini for years so when I spotted this guy having overlanded in one, I wanted to hear his story. Journey: For three months, Freddie drove from England via East Europe to Turkey after which he returned to the Balkans, Italy and Tunisia. He completed his journey circling back up via Italy and France to England. Well, for starters, I already had the Mini. Also, I loved the idea of doing a trip in a ‘fun’ and unsuitable vehicle. Everyone loves Minis and that showed everywhere we went. 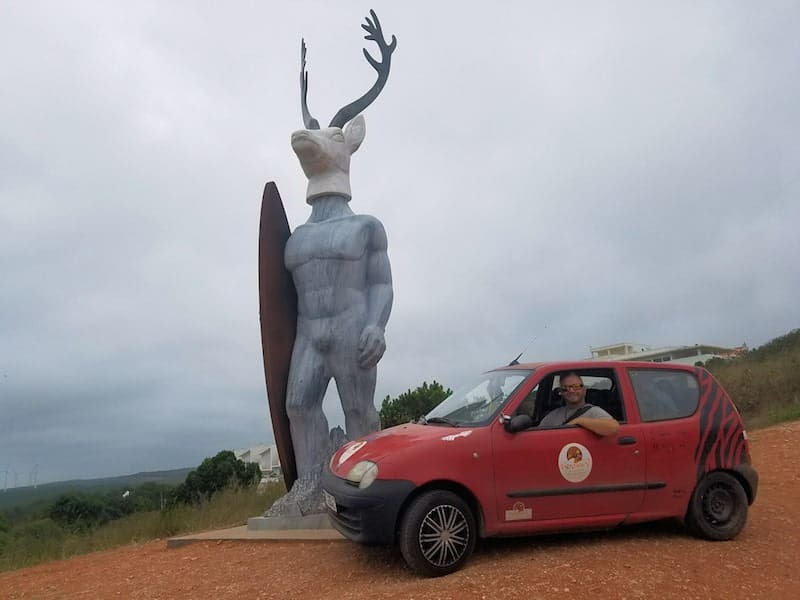 Whenever we stopped people loved the car and wanted their photo with it, people even invited us to stay with them or gave us free camping purely because of the Mini. Was the Mini a good choice? Absolutely! It was the reception we received everywhere, people just loved the Mini. Sometimes kitted out and expensive overlanders can give off the wrong impression, especially in poorer countries, but the Mini was spot on. Would you recommend overlanding in a Mini? Yes, but take a bag of spanners with you. When you break down don’t stress, enjoy it. It means you stop, talk to locals, get help, get invited to stay with people and eat as a local. Don’t rush to a destination, enjoy the journey. Pro: That people were instantly friendly when they saw the mini. Don’t listen to what anyone tells you about needing lots of equipment and a big budget. You can go anywhere in the world with any car, 2wd, 4wd, big or small. Unless you’re competing in the Dakar there’s absolutely no need for jacks, jerry cans, and sand ladders. Follow Freddie’s adventures on Instagram. What is more ordinary than a Fiat? And raising money for charities such as Cool Earth, Cancer Research UK and Marie Curie along the way. Here’s what Matt has to share. 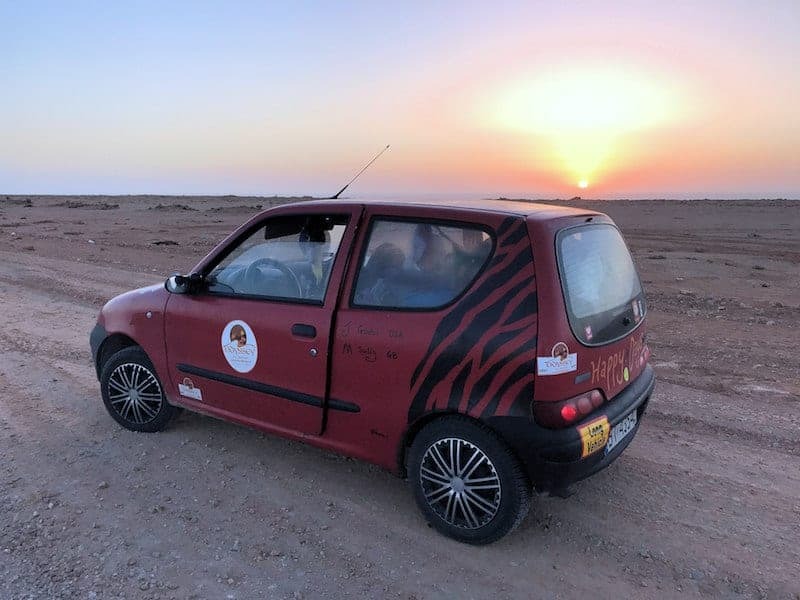 The UK to Dakar via the Arctic Circle back to East Europe, France, Spain, Morroco, Western Sahara, Mauritania, Senegal and back via Spain to the UK (8 weeks, 27,000 miles). Fiat Sciencio. 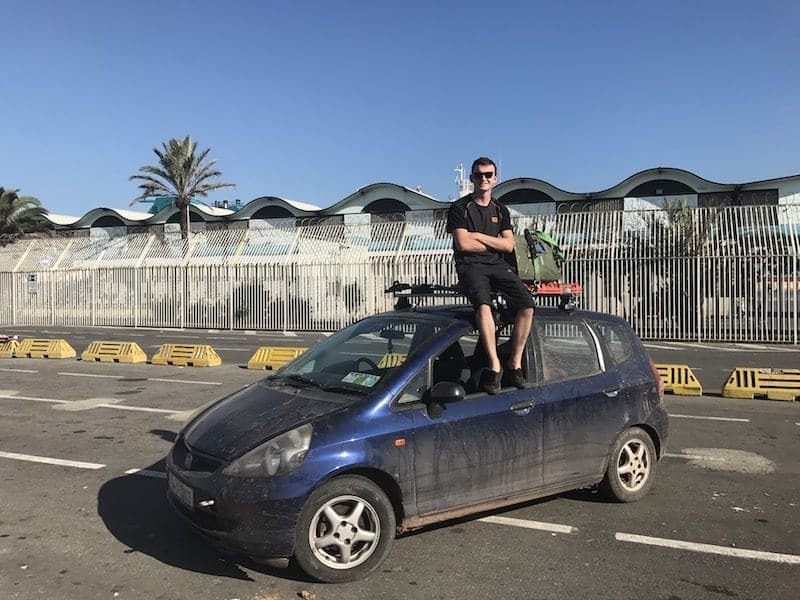 I bought the Fiat Punto because it had to be small as are the rules for the Mongol Rally. Were the Fiats a good choice? The Fiat Punto was a good choice, being very fuel efficient and petrol unleaded. I took two spare 20-liter containers but only needed to use one, once in Uzbekistan as fuel was not sold in petrol stations but had to be bought at the black market. 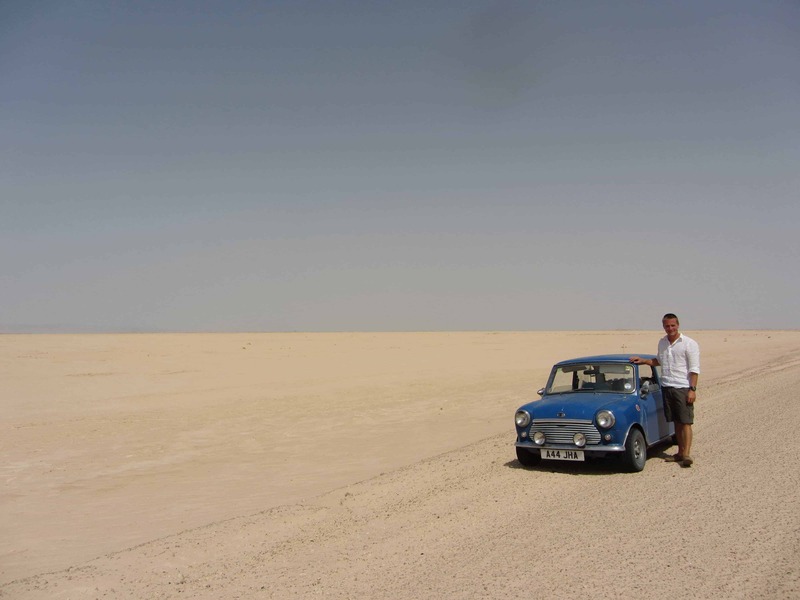 In Marocco, however, the car struggled with ground clearance but I loved using it off road wherever I could. You know what you require after the first journey. So after the Mongolian trip I was set up for the others. I packed with essentials, for the car as well as for clothes. For accommodation I used hotels or slept next to the car and had the odd tent experience. The car was cramped but many nights out in the desert it was summer, so it was not a problem. We wrote off the Fiat Punto in Sweden after a double trailer knocked us off the road. So we hired a Golf GTI up until Helsinki. We hammocked/tented in Norway and Finland. We bought a Fiat Scienco in Poland, a daft but small car, very fuel efficient. I replaced the wheel bearings, two new tires and she drove sweet as a nut for the rest of the journey. We did have a few punctures but when doing 27,000 miles you expect that. Would you recommend overlanding in a Fiat? Drive what you feel comfortable in. For me it has been something that is fuel efficient. Small yes, daft yes, but a vehicle to do the job. Go with what you can afford. Whether it be a cheaper small engine vehicle or a massive 4×4 rig. 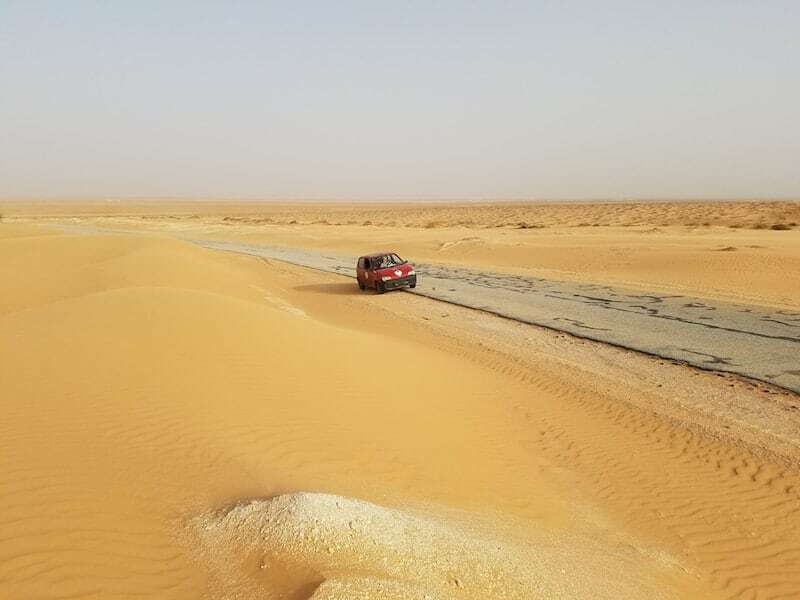 We went offroad, Mauritania to Senegal Border, Diama Dam was 30 km offroad. But mostly the roads we drove in Africa were fine. Cons: The fact you cannot go over rough terrain. Don’t get caught up in the getting to a certain point in your journey. If you want to explore where you are for a little longer, just do that, be very flexible and fluid in your plans. Try not to spend too much on things you think you might require, as you probably won’t need them. A jack, spades, axle stands, a spare tire is what you require for our trips. Follow Matt’s adventures on his website or Instagram. One day, in Brazil, we got stuck in a muddy valley with all roads around us only going up. The Land Cruiser’s tires were completely worn and had no grip whatsoever. In the distance we heard a rumbling sound, and from around a corner came a Beetle with snow chains, easy making its way through the muddy soil. We then knew: a Beetle takes you anywhere. 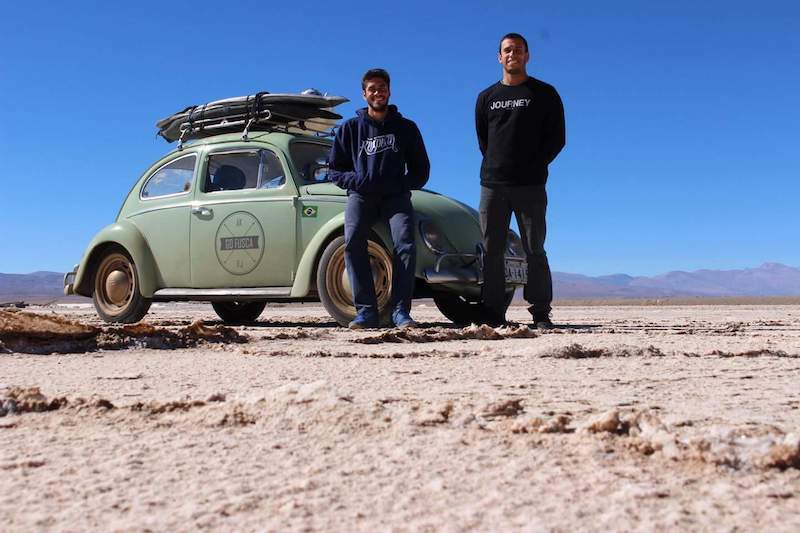 Meet these Brazilians with their Fusca. 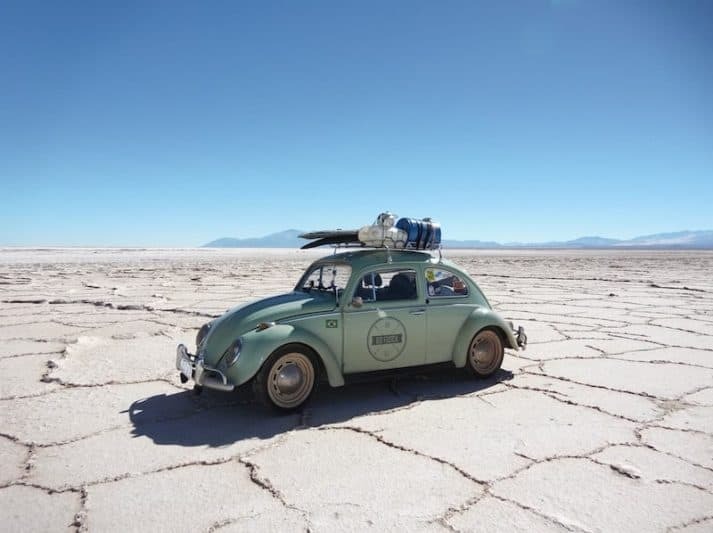 Journey: Igor and Mateus left Brazil last September, drove down to Argentina and Chile, and up the Andean countries to Colombia and Central America. They are currently in Costa Rica and plan to drive up to Alaska and arrive there in May. First of all we didn’t have money to buy a brand new car. So we decide to buy a Volkswagen Fusca. It must be an old one because it’s cheap and we know and believe that would be possible. Besides this is a car that has simple mechanicals so we (or somebody else) are able to fix it easily and cheaper than if it were a newer and modern car. 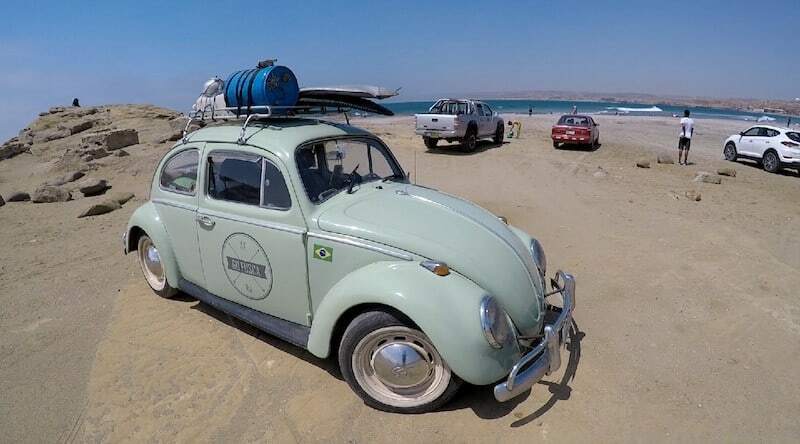 Were the Fusca a good choice? Yeah, definitely. We have had only one big problem, in Argentina in the middle of nowhere after we stopped to eat and put in some gas and the car didn’t want to start. We tried everything we could but didn’t work. The next day we stopped a truck from Paraguay, explained the situation and he drove us to a mechanic who fixed the car in 15 minutes. Would you recommend overlanding in a Fusca? It’s a really tough vehicle for sure, but it depends on the needs of each traveler. Just need to make a thorough check of the mechanical parts before your leave. Ours is a 1967 model and for us, it’s been perfect. Pros: It’s easy to fix the car and it’s pretty small which makes it easier to find a place to park it safely. Just realize that the car you are buying will be like your son. You have to take care of it for you to take you to your destination. Check out the mechanical part, customize it to your needs for your trip and that’s it. The road is waiting for you! Follow their journey on Instagram or Facebook. My grandmother had a Vespa and so the sight of one brings memories to my childhood. So when I learned Juvena was actually driving from Asia to Europe on one, of course, I started following her journey. 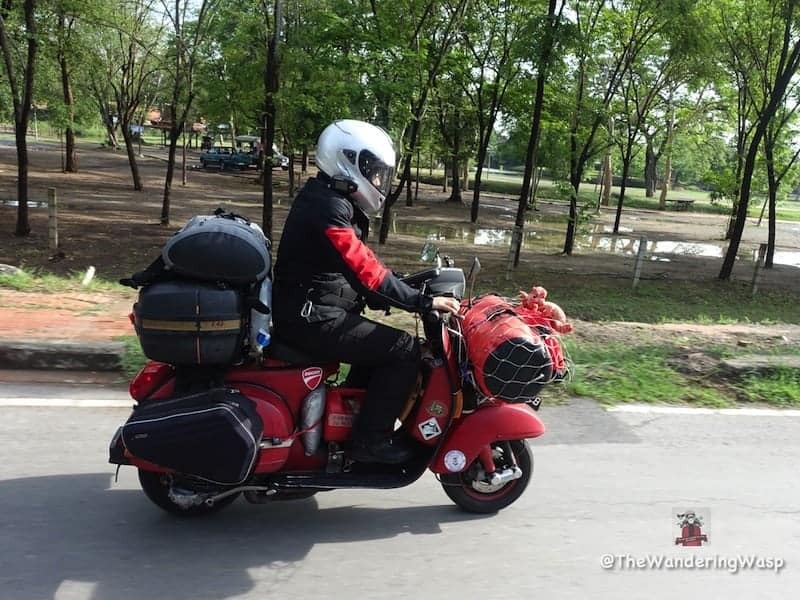 25 countries over 44,000km in 27 months. The countries included Malaysia, Thailand, Myanmar, India, Nepal, Pakistan, Iran, Armenia, Georgia, Turkey, Bulgaria, Macedonia, Serbia, Bosnia & Herzegovina, Croatia, Montenegro, Albania, Greece, Kosovo, Italy, Liechtenstein, Switzerland, Germany, Austria and the Czech Republic. I had the Vespa scooter ever since I obtained my driving license. A late friend told me, “It is the rider, not the bike.” I just went with whatever I have. 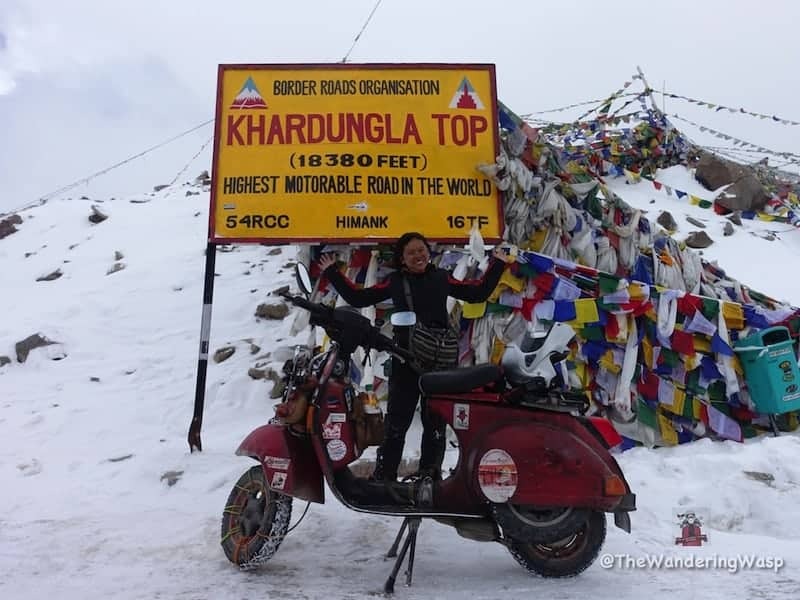 Were the Vespa a good choice? I think it is a good choice for me because it is small, light and simple. Vespa scooters are quite ubiquitous throughout the world and a great conversation starter with the locals. Would you recommend overlanding on a Vespa? The choice of vehicle is very personal. The Vespa scooter is comfortable for me as I am small built but may not be the case for someone who is big built. Pro: The simplicity of the engine. It is mechanical and easy to fix. Parts are not that difficult to find. Con: The low clearance and small tires. Going off road is very bumpy. In Tehran, Iran, I wore my helmet to buy groceries in a supermarket because I forgot to bring a headscarf. To see what her journey was all about, check out her website or Facebook page. I hope you enjoyed these stories. Are you overlanding in a 2WD? We’d love to hear your story! Please share in the comment section below. Great article. Really puts things into perspective when looking at the iverland community on Instagram. All you see is 4×4 trucks with big tires. Good to see these 2wd vehicles conquering some nasty terrain. Going to keep driving my 2wd tacoma til the wheels fall off, and probably longer. I wrote an article about 2wd OVERLANDING to encourage people to not be so rushed to trade in their vehicle or stay home.